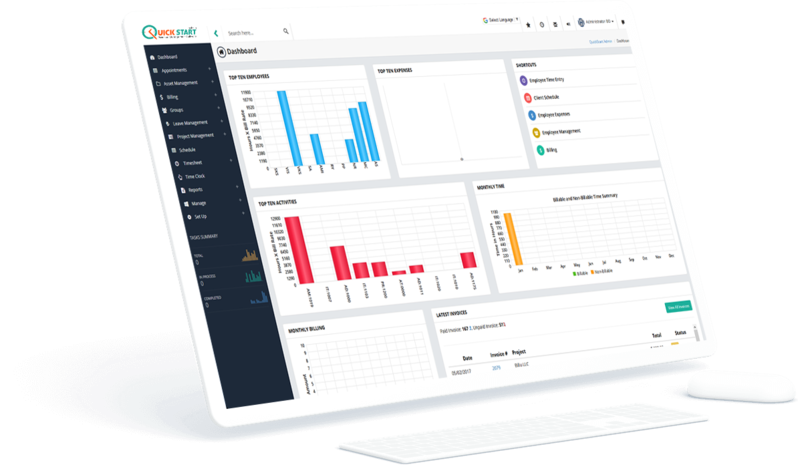 This time and cost saving application improves organization efficiency and gives complete control over projects by providing real-time reporting. Share files with other users on their email. QuickStart is a complete office automation tool for an organization. Improves organizations’ efficiency and gives complete control over projects. Control what employees can do and see online. know coverage and scheduling availability information. Unlimited access from anywhere (nothing to install or upgrade). Time off requests can be done online. All information is secure and password protected. We have called QSA customer service may times. Every time we call we get calm and patient support engineer. I am always happy and the server is definitely the best. What a life saver!!!! We've used QSA for the last five years. It has proved to be the perfect solution for our timekeeping and billing needs. QSA is easy to use and can be tailored to fit your specific needs. The program has a variety of easy-to-use features and an extensive catalog of reports that can be tailored to meet the most specific of requirements. And, if needed, they have a fabulous team who will develop a custom report, tailored to fit your specific needs and reporting requirements. Timesheet entry is very easy and only as accurate as your data entry. Project setup and Client setup is very user-friendly. We have been using QSA for 3 years now. Software is packed with features and the customer service is best out there. For billing, timekeeping, invoicing, and reporting, Quickstart is an excellent choice for the professional services firm. Their support staff are accessible (i.e., minimal hold times) and always helpful. I have been using BillQuick for about 2 years. There have been a few glitches along the way, but for the most part if has been an excellent program. What I like best is that it is easy to use and the tech support is outstanding. Seeing QuickStart Admin in action is the best way to understand the true power and simplicity of the QuickStart. Complete the form below to see a demo of the QuickStart. Once the form is submitted, we’ll give you a call in one to two business days.